Summary: Sow bugs, Roly-poly and woodlice are interchangeable names for the tiny crustaceans you may find in your garden. These bugs are attracted to moisture, so the best way to get rid of them is to eliminate their water source. Sow bugs are tiny pests that resemble pill bugs. Both sow bugs and pill bugs may be referred to as woodlice, roly-polies, or potato bugs, but they are two different species. Amazingly, these bugs are actually crustaceans. The difference between these two species is that pill bugs can roll into a tight ball when threatened, and sow bugs cannot. However, sow bugs do have a great defense mechanism in that their shells are very distasteful to predators. Sow bugs are about Â¼ long and have segmented backs. They have seven pairs of legs and two pairs of antennae. They have pores that act as their lungs, allowing them to take in and give off gases. But, they are different from other insects because their pores are not able to close. Sow bugs love to eat decaying plants. They will feed off of plant matter without any regrets. So, if your garden has dead leaves or mulch containing decomposing matter, sow bugs will be sitting pretty. You would think that they would eat the dead things and stay away from your nice, healthy plants, right? Well, this might be the case for a short while. But as soon as sow bugs run out of decaying foods to eat, they will move on to your award-winning flowers or vegetables in order to survive. This is a big reason you may want to control the sow bug population. Sow bugs require moisture to thrive. This means that if you overwater your garden or potted plants, sow bugs will come out to play. These tiny pests have a waxy shell that does not allow them to retain water. In essence, they are constantly thirsty. 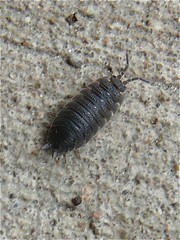 The tiny sow bug can become a problem when it crawls indoors. The easiest way for them to sneak inside is through cracks or crevices in windows, doors, or the foundation of your home. It tends to travel in packs of hundreds or even thousands. Yet another reason why you may want to get rid of them. Oddly enough, sow bugs in your home can have an advantage. If you start seeing sow bugs it is a sure sign that some areas of your home may have too much moisture. This means that you could develop mold or mildew growing in your basement or crawl space. ¢ Make sure to ventilate your home. A dehumidifier is a great tool to use against sow bugs. ¢ Replace ripped screens in your doors or windows. ¢ Caulk any cracks you can find in your home's foundation. ¢ Keep firewood and piles of leaves away from the side of your house. Sow bugs naturally move towards these food sources. ¢ Weather-strip the exterior doors in your house, especially the door to your garage. ¢ If sow bugs do wander inside, vacuuming them up is the most efficient short-term solution. ¢ Spread diatomaceous earth over the mulch in your garden. Make sure you are using the horticultural kind, and not the kind for pool filters. Sow bugs will walk over the diatomaceous earth and it will wear down their cuticles. This, in turn, will limit the amount of moisture they can retain. Page generated in '.0.0754.' seconds.